It started with the discovery of a young woman’s brutalized body in an old Charleston graveyard I’ve been hired to restore. The clues to the killer—and to his other victims—lie in the headstone symbolism that only I can interpret. Devlin needs my help, but his ghosts shadow his every move, feeding off his warmth, sustaining their presence with his energy. To warn him would be to invite them into my life. I’ve vowed to keep my distance, but the pull of his magnetism grows ever stronger even as the symbols lead me closer to the killer and to the gossamer veil that separates this world from the next. 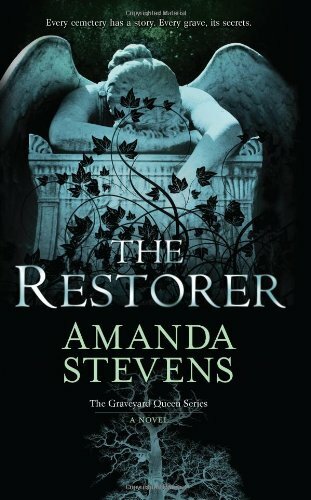 THE RESTORER is a chilling ghost story/murder mystery. It was “now I have to sleep with all the lights on” spooky, and I devoured it! This is the story of Amelia Gray, a cemetery restorer. She’s become a minor celebrity as “The Graveyard Queen” among taphophiles (cemetery enthusiasts). What most people don’t know about her is that she can see ghosts. When she was a young child, her father gave her strict rules for dealing with ghosts: Don’t acknowledge them; stay close to hallowed ground; avoid people who are haunted; and, never tempt fate. Sounds like excellent advice to me! Unfortunately for Amelia, she becomes entangled in a murder mystery that has her breaking all the rules and paying the price for it. Amelia is hired to restore Oak Grove Cemetery situated on Emerson University property. Soon after she arrives, the body of a woman very recently killed is found dumped in one of the graves. This disturbing event brings her together with Detective John Devlin of the Charleston PD. There’s something about Devlin that draws Amelia to him, which is most unfortunate because…he’s haunted. It’s not long before another murder victim is discovered, and both crimes may or may not tie in with a murder that occured 15 years ago under similar circumstances. And, is the secret organization at Emerson known as the Order of the Coffin and the Claw somehow involved? The police need Amelia’s expertise in cemetery symbolism to help crack the case. So here she is, breaking the rules her father set, and most definitely tempting fate. THE RESTORER was a very well crafted paranormal murder mystery. It was so creepy and so good. I enjoyed the author’s descriptive writing style. I loved the cemetery setting, the spooky ghosts and the sense of foreboding I felt when I knew twilight was approaching. I loved Amelia. She was a smart and tough heroine with a very unique job. I think it would be fascinating to research the history of old cemeteries and analyze gravestone carvings. I’m a bit of a taphophile too, so I was really pulled into this story. The Amelia/Devlin attraction was a bit unbelievable. 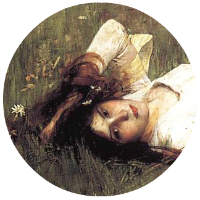 He was so pained and withdrawn, yet she wanted him the whole book. But why? Considering his history and who his ghosts were? Eek. Personally, I would not want to open that can of worms. But then there would be moments where we’d get a fleeting glimpse of the man he used to be, and I’d think, “Is he redeemable?” Maybe. I’m very curious to see where the author takes their relationship in the next book. While the main mystery in THE RESTORER is wrapped up nicely, we’re left with many unanswered questions. Are the members of the Order of the Coffin and the Claw good or evil? Who was the private investigator giving Amelia tips, and what does he want from her? Will Devlin ever be free of his spectral burdens? I’m looking forward to finding out some answers in the second book, THE KINGDOM. This entry was posted in Gothic Fiction, Paranormal Fiction, Paranormal Romance, Reviews, Romance, Suspense/Thriller and tagged 4.5 Stars, Amanda Stevens, Ghosts. Bookmark the permalink.